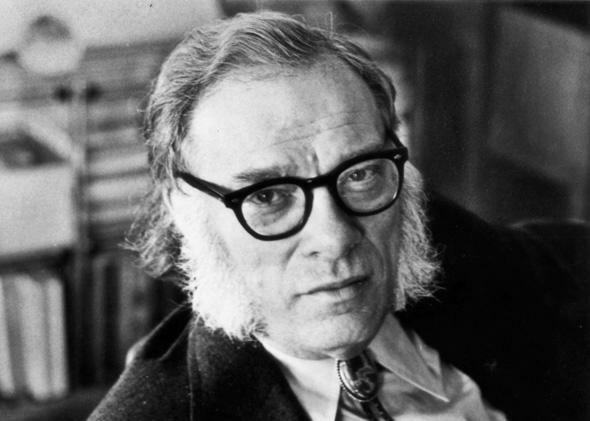 The Caves of Steel, The Naked Sun: Isaac Asimov’s portrayal of radical life extension. The sci-fi legend on the downsides of living a long life. Isaac Asimov, here in the 1970s, addressed in his robot novels the implications of a very long life. Isaac Asimov was the foremost science fiction writer of the second half of the 20th century. He was notoriously prolific, churning out hundreds of books. Late in life, he reflected: “I wanted to write fictional history in which there are no true endings … in which, even when a problem is apparently solved, a new one arises to take its place. To this end, I sacrificed everything else.” Asimov’s style was that of the pulps he came up in. His characters are, by his own admission, cutouts; his prose is not subtle. But he was very good at what he set out to be good at—positing technological solutions to societal problems and then figuring out what new problems these solutions entailed. His laws of robotics, a schema for virtuous automation, were one such exploration. Because he explicitly wrote three laws, they were reified in the canon of science fiction, a process helped along when Will Smith probed their limits in a film adaptation. But Asimov was concerned not only with robots, but also with the implications of longer human lifespans. If we’re going to talk about the social and political consequences of longer lives—as Future Tense is doing with a special package—then we should listen to Asimov, who suggests longevity leads to selfishness and stasis. The murder mystery The Caves of Steel was Asimov’s first big success as a novelist. In the book, the victim is a roboticist from Aurora, the first of 50 planets colonized by explorers from Earth (“Spacers”). The first colonists were selected for their abilities and so were healthier than average. Their ships were sterilized and so brought no diseases with them. The Spacers have become a sort of galactic upper class, more technologically advanced and military powerful than those left on the overpopulated, resource-strained Earth. While Earthlings live to about the same age we experience today, the Spacers expect much lengthier lifespans. The contrast is highlighted by Elijah Baley, a police detective on Earth, and Hans Fastolfe, an Auroran politician who was a colleague of the murder victim. Fastolfe expects to live to be between 300 and 350. But he is wary of the drawbacks of such a long life. “If you were to die now,” he says to Baley, “you would lose perhaps forty years of your life, probably less. If I were to die, I would lose a hundred fifty years, probably more.” Fastolfe goes on to sketch out for Baley the mores of Auroran society. The birth rate is kept low, “Developing children are carefully screened for physical and mental defects before being allowed to mature,” and humans constitute a sort of leisure class, with all the labor done by robots. Baley is horrified by all of this, but not for the same reasons as Fastolfe, who is troubled by his society’s stability. “It is possible to be too stable,” he says. In Auroran culture, “individual life is of prime importance.” Aurorans are, in his view, unable to collaborate with one another, and too risk-averse, because of their longevity. Asimov followed The Caves of Steel three years later with The Naked Sun, in which Baley travels to Solaria, another Spacer world. Whereas Aurora boasts 50 robots for every person, on Solaria, there are 10,000 for each individual. On Solaria, there is a strong taboo against physical contact, which is thought to be inherently dirty, and the 20,000 residents “view” one another by a sort of hologram-video-conferencing. Solarians, even more than Aurorans, are devoted to individual comforts. The Solarians, in their splendid isolation, have no police detectives. This is why they call on Baley, from Earth—until the murder of the story, they claim to have had no crime. “We on Solaria have no experience with these things. In a way, we don’t understand people. There are too few of us here,” a Solarian leader tells Baley. The Solarians are individually wealthy and long-lived. But they do not innovate or, really, love. In Greek myth, long life is portrayed as individually perilous. Mortals are given immortality by way of punishment, as with Tantalus and Sisyphus. As a favor to Eos, the goddess of the dawn (not coincidentally known as Aurora in Roman mythology), Zeus bestows eternal life on her lover Tithonus. Tithonus lives forever but ages cruelly, becoming weak and senile. The same set of concerns underlies the various retellings of the legend of Faust, as in Oscar Wilde’s Dorian Gray, in which the quest for youth has perverse consequences at an individual level. It’s easy to dismiss Asimov’s imaginings as unrealistic. Earth, in The Caves of Steel, has a population of 8 billion, scarcely more than its present population. The only way to grow enough food to support the population is through giant vats of yeast—Asimov claims the population is far too large for conventional agriculture to suffice. But much of what he predicts resonates in small ways. Nobody now lives in the isolation of a Solarian, and yet my office is filled with people who prefer to send emails to one another instead of walking 10 seconds to briefly converse. (I suspect this is not atypical.) The children of the privileged are raised in structured, sheltered environments that have more of a common feel with Asimov’s Aurora, filled with individualistic strivers, than they do with the Earth of Caves, in which kids roughhouse harmlessly, blowing off steam in a shinier version of the 1950s. His books are useful antigens to Whiggish ideas of technological progress. Earth will never become Aurora. But the tonier parts of Silicon Valley are already starting to resemble it. Asimov viewed part of the task of science fiction as accustoming readers to the idea of change, to the knowledge that “things will be different,” and so to help them plan for change with wisdom. Part of that wisdom is undertaking a healthy skepticism of technological fixes to problems like aging.